Saheed Adebayo Akinfenwa (born 10 May 1982), is an English professional footballer who plays as a striker for Wycombe Wanderers. He is known for his physical strength and heavy build. Akinfenwa's first professional breakthrough came at Doncaster Rovers, having spent time up until then in the lower leagues of English football as well as spells in Lithuania and Wales. Following a short but successful time at Doncaster, Akinfenwa moved to his seventh club, Torquay United. He proved to be a goal threat, but left the struggling team the following season to join Swansea City. After spending two seasons with the Welsh club, he joined League One side Millwall and later moved to Northampton Town. Akinfenwa spent six years switching from Northampton to Gillingham, where his goal-scoring ability was still apparent. In June 2014, he signed for League Two side AFC Wimbledon, and two years later Wycombe Wanderers. Akinfenwa is a close friend of Clarke Carlisle, his former teammate at Northampton Town. As a child, he supported Liverpool and his favourite player was John Barnes. His father is a Muslim and his mother is a Christian, and while Akinfenwa observed Ramadan as a child, he is now a Christian. Akinfenwa has become well known for being ranked as the strongest footballer in the world in various editions of the FIFA videogame series. In September 2014 he was invited to attend the launch party for FIFA 15 alongside various celebrities and Premier League players such as Rio Ferdinand, George Groves and Lethal Bizzle. Akinfenwa reportedly weighs around 16 stone (101 kg) and can bench press 200 kg, almost double his own body weight. He runs a clothing label called Beast Mode On which plays on his strong man reputation. Akinfenwa was born in Islington, London. As a teenager, he joined the Lithuanian club FK Atlantas on the advice of his agent, whose Lithuanian wife's brother knew a member of the coaching staff there. He received racial abuse from fans in the country, later saying "Coming from London, where nobody would disrespect me, this was just brazen". He spent two years at the club before returning to the UK early in 2003, where he joined Welsh Premier League champions Barry Town. Akinfenwa helped Barry to Welsh Cup and Welsh Premier League silverware during his time at Jenner Park. However, just a handful of matches into his stint, the club suffered a financial crisis and released its professional playing staff. Akinfenwa quickly joined Boston United in October 2003, scoring a last minute winner on his debut against Swindon Town in the Football League Trophy. Unable to settle, he moved to Leyton Orient the following month, but was released after one month. In December 2003 he moved to Rushden & Diamonds and in February 2004 joined Doncaster Rovers, his fifth club of the season. In July 2004, Akinfenwa changed clubs again, signing for Torquay United, as a replacement for David Graham. He scored 14 league goals during the 2004–05 season but was unable to help the club avoid relegation to League Two. He declined to sign a new contract with Torquay at the end of the season. In July 2005, Akinfenwa moved to Swansea City, who were ordered to pay an £85,000 fee as compensation. He scored on his debut against Tranmere Rovers, and this was also the first competitive goal scored at Swansea's new Liberty Stadium. He scored the winning goal in the 2006 Football League Trophy Final, in which Swansea beat Carlisle United 2–1. He also helped Swansea reach the League One promotion play-off final in his first season. After a 2–2 draw, the match went to a penalty shoot-out but Akinfenwa was one of two Swansea players to miss with their penalties, granting promotion to Barnsley. He was a regular the following season, until a broken right leg in the 2–0 defeat at home to Scunthorpe United ended his season. This followed a fractured left shin the previous October. At the end of the 2006–07 season, he rejected a new contract with Swansea, and agreed to sign for Swindon Town on 29 June 2007. However, he failed a medical. Following this, in November 2007 he joined League One team Millwall on a month-to-month contract, however he failed to score any goals in seven appearances. On 18 January 2008 Akinfenwa signed a deal with Northampton Town until the end of the 2007–08 season. He made his debut against Swindon Town, where he came off the bench to score a late equaliser in a 1–1 draw. He then had the same impact in his home debut, scoring the equaliser in a 1–1 draw against Leeds United. He started the following match, at home to Gillingham, and scored two goals in a 4–0 win. He scored three further goals that season. On 30 May 2008, Akinfenwa signed a new one-year contract at Northampton despite declared interest from Leyton Orient and Grimsby Town. He started the 2008–09 season well, scoring twice in three matches by the end of September. Akinfenwa ended his stay at Northampton in May 2010. He had been offered a new deal but Northampton could not agree a deal with him within an agreed timeframe. On 29 July 2010, he signed for Gillingham on a one-year contract, and scored on his debut with a header against Cheltenham Town. 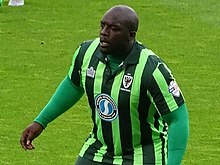 Whilst at the Gills, Akinfenwa was able to form a strong partnership with Cody McDonald and the pair were able to score 36 goals between them that season. Akinfenwa returned to Sixfields on 25 May 2011, after new Cobblers manager Gary Johnson brought him in to "capture the imagination of the supporters". He scored his first goal against Bristol Rovers on 16 August. On 10 November 2012 in a match against Accrington Stanley, Akinfenwa scored his first, and to date only, professional hat-trick. Three years later, with Northampton struggling financially, Akinfenwa auctioned off the shirt he wore in this match and donated the proceeds to a supporters' trust, raising £440. Northampton Town released him at the end of the 2012–13 season. Akinfenwa re-signed for Gillingham on a free transfer on 2 July 2013. After reigniting his successful partnership with Cody McDonald, scoring 10 goals over the course of the 2013–14 season and coming third in their Supporters Player of the Year awards, Akinfenwa left the club on expiry of his one-year contract. On 20 June 2014, he signed for League Two side AFC Wimbledon, who had pursued his signature for 14 months. In the third round of the FA Cup on 5 January 2015, in which AFC Wimbledon hosted Liverpool at Kingsmeadow, Akinfenwa equalised against the club he supports, albeit in a 1–2 defeat. On 8 June 2015, Akinfenwa extended his contract with Wimbledon, spurning interests from clubs in League One and Major League Soccer. On 30 May 2016, after scoring a penalty in a 2–0 win against Plymouth Argyle in the League Two Play-off Final, Akinfenwa was released from his contract. He told Sky Sports in his post-match interview: "I think I'm technically unemployed, so any managers hit me up on the WhatsApp and get me a job." Following his departure from AFC Wimbledon, Akinfenwa signed for Wycombe Wanderers, initially on a one-year contract. In April 2018, he was nominated for the EFL League Two Player of the Season award. ^ a b c Hugman, Barry J., ed. (2010). The PFA Footballers' Who's Who 2010–11. Edinburgh: Mainstream Publishing. p. 17. ISBN 978-1-84596-601-0. ^ "Adebayo Akinfenwa". Wycombe Wanderers F.C. Retrieved 17 November 2018. ^ a b "How Port Vale will tackle the world's strongest footballer". The Sentinel. 31 January 2014. Archived from the original on 25 February 2014. Retrieved 2 February 2014. ^ a b c d e "Adebayo Akinfenwa: Wimbledon's 'Beast' – 10 things you never knew". BBC Sport. 6 January 2014. Retrieved 6 January 2015. ^ a b Flanagan, Aaron (25 September 2014). "FIFA 15's strongest player Adebayo Akinfenwa admits he doesn't play as himself – as he's TOO SLOW! – Mirror Online". Daily Mirror. Retrieved 3 January 2015. ^ Drayton, John. "Adebayo Akinfenwa hits beast mode for AFC Wimbledon against Chelsea | Daily Mail Online". Daily Mail. Retrieved 3 January 2015. ^ Snelling, Dave (23 September 2014). "FIFA 15 SPECIAL: Stars Rio Ferdinand, Lethal Bizzle, Andros Townsend & Olly Murs | Beauty and Fashion UK, Horoscopes". Daily Star. Retrieved 3 January 2015. ^ Standard Sport (11 September 2014). "Justice for Akinfenwa as AFC Wimbledon star is named FIFA 15's strongest player – Football – Sport". London Evening Standard. Retrieved 3 January 2015. ^ "Barry sign second Nigerian". BBC News. 21 March 2003. Retrieved 6 January 2010. ^ "Akinfenwa catches the eye". BBC News. 2 December 2003. Retrieved 6 January 2010. ^ "Boston United 2–1 Swindon". BBC. 14 October 2003. Retrieved 5 February 2010. ^ "Orient release Akinfenwa". BBC News. 2 December 2003. Retrieved 6 January 2010. ^ "Doncaster get Akinfenwa". BBC News. 18 February 2004. Retrieved 6 January 2010. ^ "Gulls seal Akinfenwa deal". BBC News. 3 July 2004. Retrieved 6 January 2010. ^ "Gulls and Akinfenwa in deadlock". BBC News. 21 June 2005. Retrieved 6 January 2010. ^ "Tribunal rules on Akinfenwa fee". BBC News. 28 July 2005. Retrieved 6 January 2010. ^ "Swansea 1–0 Tranmere". BBC. 6 August 2005. Retrieved 1 May 2010. ^ "Swansea 2–2 Barnsley (aet)". BBC Sport. 27 May 2006. Retrieved 2 June 2017. ^ "Leg break ends Akinfenwa's season". BBC News. 21 February 2007. Retrieved 6 January 2010. ^ "Akinfenwa hit by stress fracture". BBC News. 11 October 2006. Retrieved 6 January 2010. ^ "Akinfenwa resigned to Swans exit". BBC News. 18 June 2007. Retrieved 6 January 2010. ^ "Akinfenwa set to sign for Swindon". BBC News. 16 July 2007. Retrieved 6 January 2010. ^ "Jackett signs Akinfenwa". BBC Sport. 15 November 2007. Retrieved 27 May 2011. ^ "Games played by Adebayo Akinfenwa in 2007/2008". Soccerbase. Centurycomm. Retrieved 27 May 2011. ^ "Akinfenwa Commits To Cobblers". Sporting Life. UK. Archived from the original on 29 June 2011. Retrieved 6 January 2010. ^ "Prolific Striker Akinfenwa Signs". Archived from the original on 30 July 2010. Retrieved 29 July 2010. ^ "Gillingham's Adebayo Akinfenwa joins Northampton Town". BBC News. 25 May 2011. Retrieved 25 May 2011. ^ "Accrington Stanley 2 – 4 Northampton". BBC Sport. 10 November 2012. Retrieved 29 November 2015. ^ "Adebayo Akinfenwa: 'The Beast' Northampton hat-trick shirt resold". BBC News. 28 November 2015. Retrieved 29 November 2015. ^ "Adebayo Akinfenwa released by Northampton Town". BBC News. 21 May 2013. Retrieved 21 May 2013. ^ "Adebayo Akinfenwa: Gillingham re-sign ex-Northampton striker". BBC Sport. 2 July 2013. Retrieved 2 July 2013. ^ "Bayo Akinfenwa leaves Gillingham FC following second spell at Priestfield". Gillingham Football Club. 20 May 2014. Retrieved 20 June 2014. ^ Slavin, Chris (20 June 2014). "Akinfenwa signs". AFC Wimbledon. Retrieved 20 June 2014. ^ McNulty, Phil (5 January 2015). "Wimbledon 1–2 Liverpool". BBC Sport. Retrieved 20 January 2015. ^ Goodwin, Stuart (8 June 2015). "Adebayo Akinfenwa to stay with AFC Wimbledon despite MLS interest". The Guardian. Retrieved 7 February 2016. ^ "Adebayo Akinfenwa: AFC Wimbledon icon released after play-off final win". BBC Sport. 30 May 2016. Retrieved 30 May 2016. ^ Piper, Alice (31 May 2016). "Adebayo Akinfenwa's penalty seals promotion for AFC Wimbledon". Sky Sports. Retrieved 7 June 2016. ^ "Adebayo Akinfenwa: 'The Beast' joins Wycombe Wanderers". BBC Sport. 10 July 2016. Retrieved 10 July 2016. ^ "EFL awards: Tom Cairney, Ruben Neves & Ryan Sessgenon on Championship shortlist". BBC Sport. 4 April 2018. Retrieved 4 April 2018. ^ a b "A Lyga career details for Adebayo Akinfenwa". Lietuvos Futbolo Enciklopedija. Retrieved 5 January 2015. ^ a b "Welsh Premier career details for Adebayo Akinfenwa". Welsh Premier League. Retrieved 5 May 2013. ^ a b c "Games played by Adebayo Akinfenwa in 2003/2004". Soccerbase. Centurycomm. Retrieved 10 January 2014. ^ "Squad stats: 2003/04". Soccerbase. Retrieved 8 July 2014. ^ "Games played by Adebayo Akinfenwa in 2004/2005". Soccerbase. Centurycomm. Retrieved 10 January 2014. ^ "Games played by Adebayo Akinfenwa in 2005/2006". Soccerbase. Centurycomm. Retrieved 10 January 2014. ^ "Games played by Adebayo Akinfenwa in 2006/2007". Soccerbase. Centurycomm. Retrieved 10 January 2014. ^ a b "Games played by Adebayo Akinfenwa in 2007/2008". Soccerbase. Centurycomm. Retrieved 10 January 2014. ^ "Games played by Adebayo Akinfenwa in 2008/2009". Soccerbase. Centurycomm. Retrieved 10 January 2014. ^ "Games played by Adebayo Akinfenwa in 2009/2010". Soccerbase. Centurycomm. Retrieved 10 January 2014. ^ "Games played by Adebayo Akinfenwa in 2010/2011". Soccerbase. Centurycomm. Retrieved 10 January 2014. ^ "Games played by Adebayo Akinfenwa in 2011/2012". Soccerbase. Centurycomm. Retrieved 10 January 2014. ^ "Games played by Adebayo Akinfenwa in 2012/2013". Soccerbase. Centurycomm. Retrieved 10 January 2014. ^ "Games played by Adebayo Akinfenwa in 2013/2014". Soccerbase. Centurycomm. Retrieved 10 January 2014. ^ "Games played by Adebayo Akinfenwa in 2014/2015". Soccerbase. Centurycomm. Retrieved 11 October 2014. ^ "Games played by Adebayo Akinfenwa in 2015/2016". Soccerbase. Centurycomm. Retrieved 9 January 2017. ^ "Games played by Adebayo Akinfenwa in 2016/2017". Soccerbase. Centurycomm. Retrieved 9 January 2017. ^ "Games played by Adebayo Akinfenwa in 2017/2018". Soccerbase. Centurycomm. Retrieved 2 October 2017. ^ "Games played by Adebayo Akinfenwa in 2018/2019". Soccerbase. Centurycomm. Retrieved 8 October 2018. ^ "Carlisle 1–2 Swansea". BBC Sport. 2 April 2006. Retrieved 24 December 2018. ^ Pilnick, Brent (30 May 2016). "AFC Wimbledon 2–0 Plymouth Argyle". BBC Sport. Retrieved 24 December 2018. ^ "Bayo honoured to win awards". AFC Wimbledon. 3 May 2015. Retrieved 1 May 2017. ^ "Player Awards Dinner 2017: Bayo awarded Bucks Free Pass Supporters' Player of the Season". Wycombe Wanderers F.C. 30 April 2015. Retrieved 1 May 2017. Wikimedia Commons has media related to Adebayo Akinfenwa.